myoldmac.net - Buy it now! 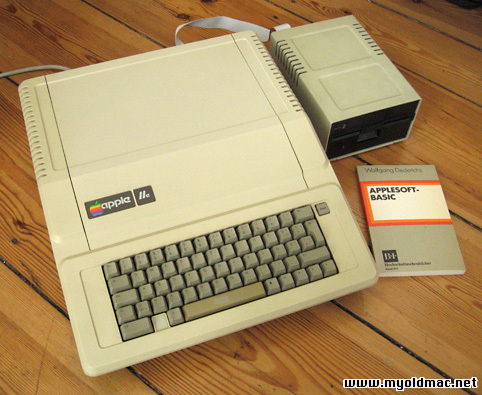 The Apple IIe was the third model in the Apple II line of personal computers, produced by Apple Computer. The "e" in the name stood for "enhanced", referring to the fact that several popular features were now built-in that were previously only available as third party upgrades and add-ons in earlier models. Board Revision B: In addition to supporting Double-High-Resolution and Double-Low-Resolution (560x192 and 80x40 pixels respectively, with 16 colors in each mode; with hi-res effectively 140x192 due to color placement restrictions) it also added a special video signal accessible in slot-7. After having sold more than 750,000 Apple II and II+ systems, making it one of the best-selling brands in the global computing market, Apple released an updated version of the II+, the Apple IIe ('e' standing for enhanced). It also met with very great success and was widely used in schools (still in use in 2000 in some places!). The Apple IIe was replaced with the enhanced Apple IIe in 1985, which had 128k RAM, 32k ROM, improved support for 80-column text and lowercase characters, and was powered by the 65C02 CPU, the same as the Apple IIc one. The Apple IIe is a cost-reduced yet more powerful machine that used newer chips to reduce the component count and add new features, such as the display of upper and lowercase letters and a standard 64 KB of RAM. The IIe RAM was configured as if it were a 48K Apple II Plus with a language card; the machine had no slot 0, but instead had an auxiliary slot that for all practical purposes took the place of slot 3. The auxiliary slot could accept a 1K memory card to enable the 80-column display (the card contained only RAM; the hardware and firmware for the 80-column display was built into the Apple IIe).